Social Welfare Residential Schools Common Entrance Test-2019 Admission into 6th to 9th Class - Results, TSWREIS Admission Test for 6th to 9th Classes Results 2019 |Telangana Social welfare Gurukulam Results, TSWREIS TS Social welfare 6th to 9th Class Admission Test 2019 results. Telangana Social Welfare Residential School Admission Entrance Test 6th,7th, 8th,9th Class Entrance Test results Download at Official website http://swreishms.cgg.gov.in/coe/. New TSWR Schools entrance results 2019 Download. 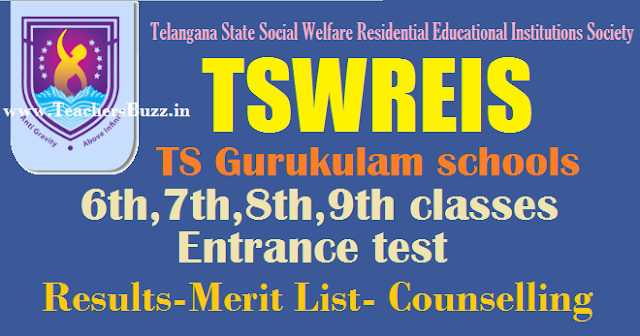 TS Social Welfare Residential Schools Common Entrance Test 2019 results,selection list.TS Social welfare Gurukulam Admission test results, hall tickets , TS Social welfare 6th Class entrance test 2019 Results, tswreis gurukulams class 6th admissions, online application form, last date for apply,hall tickets, results, certificates verification dates, Social Welfare Residential Schools Common Entrance Test-2019 for Admission into 6th to 9th Classes, Telangana SWAEROCET 2019 , Sixth class admission test results are provided here. TSWREIS was invited the online applications through online http://swreishms.cgg.gov.in/coe/ from the eligible candidates for admission into 6th to 9th classes in its TSW Residential Schools. The admission test/Entrance Test would be conducted on ........ by 11.00 AM to 01.00 PM by TSWREIS. TS Social welfare residential schools 6th,7th,8th,9th classes entrance test was conducted on 18-06-2019 . Candidates, who were appeared the entrance test they are waiting for their results. TSWREIS 6th,7th,8th,9th classes entrance test results will be released in July first week. (Mostly Expected on July 2019 ). Candidates can get the results from here. The Government of Telangana State sanctioned 118 new TSWR Schools which are going to be started from the academic year 2019 -18.There are certain backlog vacancies in classes VI to IX in existing TSWR Schools.In this backdrop, online applications are invited from eligible candidates for admission into Classes – VI to IX for the academic year – 2019 -20 to fill up vacancies in 103 new TSWR Schools and backlog vacancies in existing TSWR Institutions.